It has been a while since I posted, but I finally got inspired!! 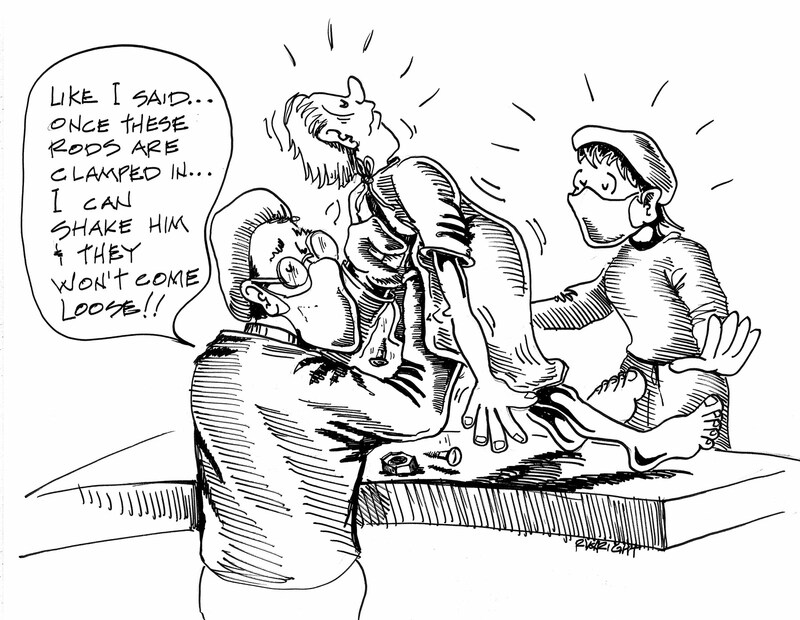 This toon is from our calendar, 2007. In 2006, Joel had a whole bunch of hardware inserted into his back to straighten out his scoliosis, and we all thought that everything would be wonderful, and he would be straight upright, and everything would be rosey, and the weather would be sunny from now on, and there would be peace on earth!! 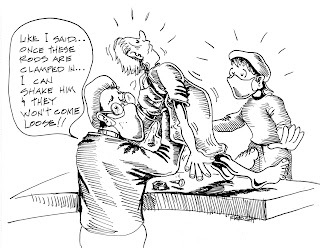 This toon gives a direct quote from Joel's doctor at the time! I added the nut and bolt lying on the table later, because, as it turned out, the operation didn't work, and it BROKE (and there was no peace on earth, and it still rains)!! He had hardware floating around willy-nilly in his back, just waiting to poke into his vertebrae, and damage his central nervous system. Needless to say, it has been a difficult few years for all of us, but especially for Joel, who has been in pain the whole time, dealing with broken hardware on two occasions, and fighting back infections. Well, as of this last week, I am pleased to announce that all that hardware that was in his back, now lies in a glass jar, and for the first time in four years, Joel is relatively without pain!! He is now back in his home in Urbana, Illinois, recovering from his recent surgery, and fighting off the infection he has been carrying in his back for the last four years. GO JOEL!!! We are all rooting for you! You rock! !